The Palazzo Fortuny, tucked away inside the small square, Campo San Beneto, is typical of the crumblingly tall Venetian architecture and is encrusted with gothic features both inside and out. When I saw the advertisement for an art exhibition I expected the usual white washed surfaces and crisp airy rooms but was delighted and surprised to step into this gloomy fantastical space and to scale the groaning wooden staircase that leads you into a darkened vault of a room stuffed full of theatrical apparatus and props. The building was once the home and studio of the multi-talented Mariano Fortuny y Madrazo and his wife who dabbled in an eclectic mix of creative pursuits from photography and engraving to theatre design, inventing and fabric printing. Unsurprisingly the Palazzo reflects this spontaneous movement through the arts and their clear passion for invention still lingers and the air seems to reverberate around your ears. The space is lit softly by large domed lamps, which cast muffled shadows of the sculptures, models and carved wooden furniture across the fabric draped walls. The huge collection of objects, all affirm Fortuny’s inspiration and give an insight into the exciting and eccentric discussions taking place in art during the turn on the 19th century. He was the son of an artist himself and was immediately immersed in the Paris art scene where he made many important friends. At the end of the 20th century Fortuny invented a new theatrical lighting system called cupola which cast an indirect light upon the props and could project images of clouds and coloured skies. After this new idea was adopted by his patron, Comtesse de Bearn it became extremely popular and was used in theatrical arts throughout Europe. On the second floor of the Palazzo was an exhibition of work entitled Metamorfosi by Maurizio Donzelli, which consisted of a series of intricate and abstract tapestries alongside kaleidoscopic paintings and mirrored collages. Donzelli could be described as an inventor and artist and has a clear interest in science and the concept of colour. The water-colour paintings of Designi del Quasi and Talisman are wonderfully fluid yet cut through by the smooth crispness of their own outline. His inspiration lies ultimately with design and he works in a variety of media from glass and paper to video and performance. His work certainly seems to reflect Fortuny’s love of the theatrical and is a feast of colour of texture. 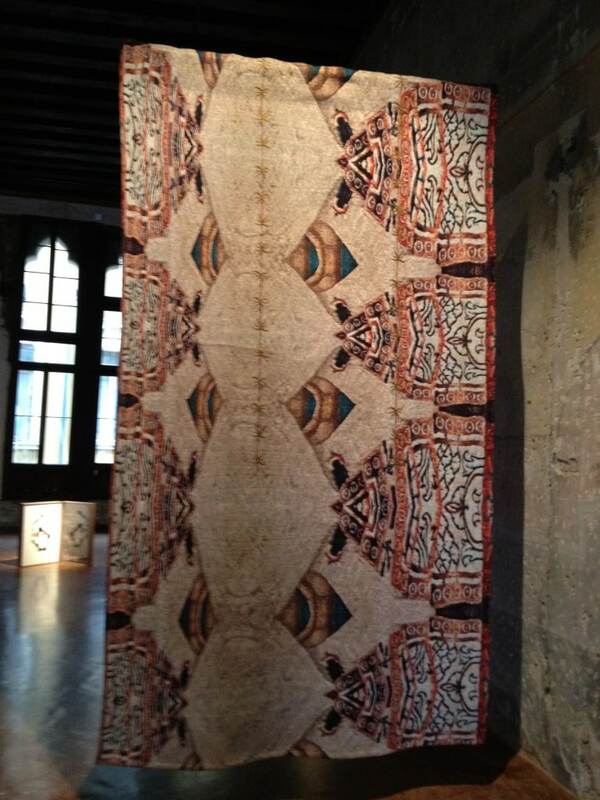 This exhibition run from 1st September – 19th November at the Palazzo Fortuny, Venice.